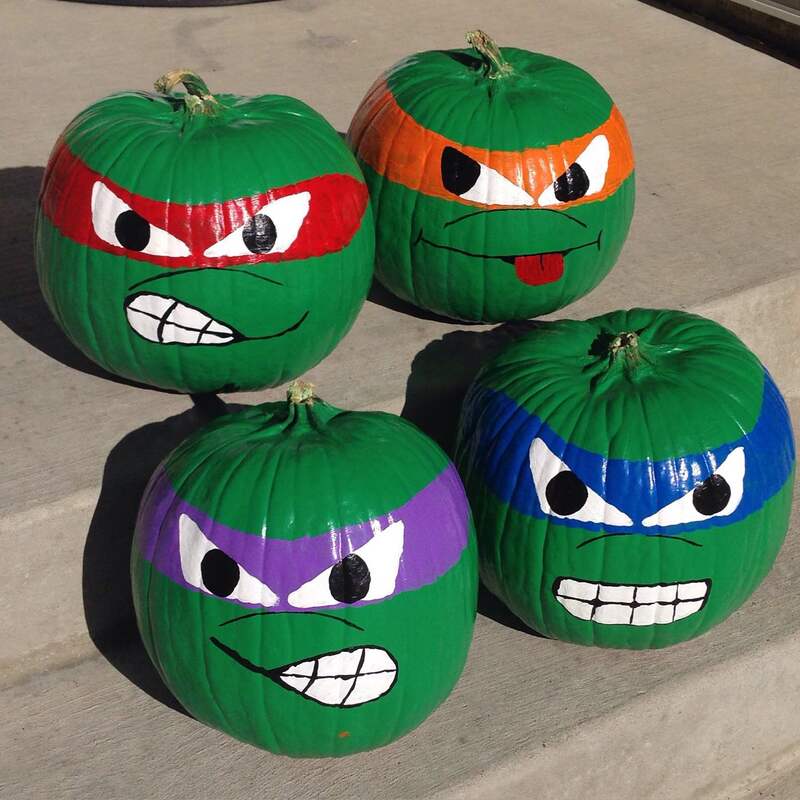 In an open area (preferably outside or in an open garage) spray paint all four of your pumpkins until they are completely covered in green. I recommend doing two to three layers of paint so the paint doesn’t make a drip look on the pumpkins. Let the pumpkins sit outside (or in the garage) over night to dry. Place your pumpkins somewhere sturdy (I used the floor and/or dining room table) to paint the eye masks on. Put a garbage bag or large piece of cardboard underneath the pumpkins to make sure the paint doesn’t stain wherever you are painting. Now you will paint each pumpkin a different mask color. If you don’t trust yourself to free hand the masks you can always use a folded piece of paper to make your lines even on the masks. Give the masks about an hour or so to dry and do at least one more layer of paint on the masks so they’re dark enough. Depending on the paint you use you may have to do more than two layers. Now that your masks are dry, you will notice there is a black line underneath each pumpkin for the “shadow” of the nose. Use your permanent marker to draw this line underneath the mask. You can use black paint with a thin paint brush if you prefer. I used the permanent marker because I could be a little more precise and it dries extremely quickly. Now take your white paint and draw the mouths on THREE of the pumpkins. It will just be a white area in the shape of the pumpkins mouth, but we will use the black paint later to draw in the teeth. If you know a little about the TMNT you will notice each facial expression matches their personality. Take your time doing this part. I looked at the picture after each brush stroke to be sure I was doing it correctly. Once you have painted the first white layer for the teeth, wait about 20-30 minutes and add one more layer so that the teeth really stand out. There is a picture underneath step 5 showing you what they should look like. Michaelangelo (the orange one) is different from the others when it comes to designing his mouth. His tongue is sticking out. Using the permanent marker OR black paint, draw a thin line almost resembling a smiley face on the pumpkin. Now take your red paint and draw a rounded out wide tongue on the pumpkin. There is a picture underneath step 5 showing you what they should look like. Once the eyes have dried, using the permanent marker draw the outline of the pupils on each pumpkin. Then, using the black paint, fill in the pupils. Now you will use your black paint again to fill in the details for the teeth on each pumpkin. Refer back to the original start picture so you are able to recreate every detail and line for each particular pumpkin. Take your time doing this step so you don’t mess yourself up and have to start over. Put your pumpkins in a dry place to dry overnight.